You see, I’ve missed getting kissed. I wind up down on my knees. When my heart my law contradicts. That’s truth of a different kind. NOTES: When I headed off to college, my long-suffering father advised me to study “something practical.” He suspected that I was likely to squander my opportunity at getting the education he never had the chance to acquire. It might have been my hair, which had not been cut since the end of football season. It might have been his knowledge that I was not the type of kid who listened to his elders. So, of course, I went straight ahead and majored in philosophy with a minor in Greek and Latin. And, also of course, the universe proved my father right. Upon graduation I entered the job market and landed a coveted job as fry cook at a pancake house. It was the only job I could get. I had gravitated towards philosophy because I wanted to find answers to the big questions of life. I wanted to find Truth, Beauty and Love, and thought that philosophy was the route. I didn’t find the answers I sought in philosophy. Instead, I grew weary of hairsplitting arguments and arcane debates about the meaning of language. By my senior year, I was tired of the whole enterprise. But I did find truth in a most unsuspected place. Not in the heavy and thick books of philosophical and impenetrable prose. But in a dusty old Bible, the same Bible my father had been pointing me towards all my life. Ironically, not only was my father right about studying something practical, he turned out to be right about where to find truth as well. But off at college, I experienced my own personal John Newton/Saul of Tarsus moment. Like the notorious English slave trader, I realized I had been blind about my own wretchedness. Like the self-righteous Pharisee, I was knocked to the ground and scales fell from my eyes. Like both of them, I was touched by grace and set on a new path with a completely fresh start. After searching for truth in the ancient writings of Socrates and Plato, and seeking power in the seductive teachings of the East, I discovered that the truth I sought had been under my nose all the time. But now that I had found truth, I still had to figure out what to do with my life. I was a decent short order cook, but I was pretty sure it wasn’t my calling. I finally hit on the idea that I needed to do something that involved writing. And in those days in the afterglow of Watergate, this meant journalism. So I went back to school to take just enough classes to land a newspaper job. We all wanted to be the next Woodward and Bernstein. I was delighted when I landed my first freelance stringer assignment. I drove to City Hall, spent 3 hours at a city council meeting, drove back home and then spent another 4 or 5 hours writing up as many stories as I could. The next morning, I drove the finished copy to the office. I was delighted that for this they’d pay me a whole 15 bucks! And if one of the stories was decent, I might get a treasured byline. What I didn’t realize was that the newspaper business had already started its long, slow decline. By the early 1980s, afternoon dailies were already going out of business all across the U.S. Newsrooms were shrinking and it was tough to get on with a major metropolitan paper. And this was all before the internet cut the legs out from under newspapers’ business model. Impatient with the career prospects at the big papers, I took a job as the editor of a financial newsletter. But things worked out, and that first direct marketing job eventually led me to doing fundraising for good causes, which has been my career for the past quarter century. But for several years — before I found the love of my life and the mother of my children — my love life followed the same tragic-comic early trajectory as my circuitous career path. Full of false starts and spectacular missteps. After one of these disasters, many years ago, I wrote the poem posted today. It’s about the only thing I have to show today for my philosophy major. NOTES: Here’s another invaluable photograph from my friend, Susumu. This must have been taken in the fall of 1968, amidst an exciting small town high school football season. It most certainly was an away game. 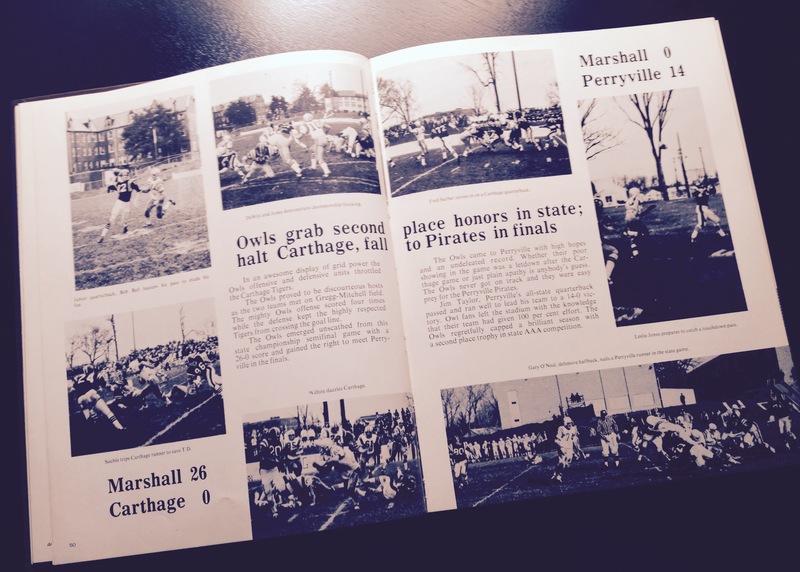 The home games of the Marshall High School Owls were played at Missouri Valley College’s Gregg-Mitchell Field, and this setting does not look familiar. I’m guessing it might have been the away game that year at the home field of our most hated rival, the Excelsior Springs Tigers. Marshall had been playing second fiddle to the Tigers for several years, just unable to put together enough power to overcome dislodge them from the top of the Missouri River Valley Conference. The year before, we had endured a humiliating defeat as the Tigers came into our stadium and beat us on a frigid night in Marshall. Those old aluminum benches had never felt so cold. This year turned out much better. Coach Cecil Naylor had us worked into such a frenzy that we could have taken on a band of Viking berserkers. We travelled into the Tigers’ home turf, took care of business, and vanquished them 20 to 0. The topic is cheerleaders. What is with their mystique? And why couldn’t they get a date with their own classmates? I could be misremembering, but it seemed that very few cheerleaders ever dated guys in their own class. Older guys might work up the confidence to “date down” with a cheerleader from lower grade. But mating between cheerleaders and a classmate was scare and rare. One of life’s great mysteries. The Cheerleader Paradox. Mysterious even when you factor in the fact that in our little town, many of us had attended school together since first grade, and the rest of us had been together in the same building since 7th grade. The long history and close familiarity meant that most of your classmates were like family. That contributed to sense that the cute girl in chemistry class seemed more like your sister or your cousin than girlfriend material. I mean, you’d grown up together! You’d seen each other on good days and bad days. Good hair days and bad. You’d fought on the playground in grade school, and competed for teachers’ attention. Not much mystery left. But even that doesn’t explain the Cheerleader Paradox. Dr. Freud, call your office. I’m open to hypotheses. So, that is what she gets on the eve of our 31st anniversary. A re-run. It was written sometime in the early 1990s. We were young and just starting a family. I had a job I absolutely hated. I would take long lunch breaks and write poems parked by the side of Lake of the Isles in Minneapolis. Long before I discovered girls, back in Marshall, MO, my first love was baseball. I knew the starting line-ups of both the St. Louis Cardinals and the Kansas City A’s by heart. Somewhere between the ages of 12 and 13, we moved on to other interests. A long and winding path led me to the love of my life. We were married 31 years ago today. The inspirations for this poem are multiple. Several years ago, it was coming on to midsummer and my wedding anniversary. In particular, I was hearing the line where Van does his improvisational thing where he repeats the words “love” and “glove” over and over in an almost hypnotic chant. My story is about a very different glove, and a very different love. But that merging of the two words was lodged in my mind. The real pain would come in the next game. Photo courtesy of Randy DeWitt. That our lives peaked there.